Paul G. Harris (ed. ), Routledge Handbook of Global Environmental Politics (hardback, 2014; updated paperback edition, 2016). 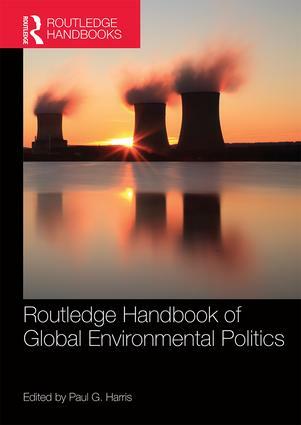 The Routledge Handbook of Global Environmental Politics provides a comprehensive and authoritative survey of global environmental politics. It brings together leading international academic experts and features 40 chapters that describe the history of global environmental politics as a discipline and explain the various theories and perspectives used by scholars and students to understand it; examine the key actors and institutions in global environmental politics, explaining the role of states, international organizations, regimes, international law, foreign policy institutions, domestic politics, corporations and transnational actors; address the ideas and themes shaping the practice and study of global environmental politics, including sustainability, consumption, expertise, uncertainty, security, diplomacy, North-South relations, globalization, justice, ethics, participation and citizenship; and assess the key issues and policies within global environmental politics, including energy, climate change, ozone depletion, air pollution, acid rain, sustainable transport, persistent organic pollutants, hazardous wastes, water, rivers, wetlands, oceans, fisheries, marine mammals, biodiversity, migratory species, natural heritage, forests, desertification, food and agriculture. With an in-depth update by the editor, this expanded paperback edition of the handbook should be an invaluable resource for students, scholars, researchers and practitioners of environmental politics, environmental studies, environmental science, geography, international relations and political science.